When my daughter was diagnosed with severe respiratory issues as an infant, we made radical changes in our household. My husband and I were committed to a more lifestyle and eliminated harsh chemical cleaners and artificial fragrances from our home. Over the years, I have found natural recipes for cleaners in different places (making it easy to misplace) so therefore I was thrilled to discover the new book, Homemade Cleaners: Quick-and-Easy, Toxic-Free Recipes. Written by Mandy O’Brien and Dionna Ford, this essential book includes a wide selection of recipes to help you to replace harsh chemical laden kitchen cleaners, bathroom disinfectant, laundry detergent, bleach, bug killers, air fresheners, stain removers, fabric dry sheets and more. This is the first book that I have ever found that is so inclusive and I couldn’t wait to read it and test out some of the recipes. Instead of having to find a bunch of recipes that I have all over the place, I can now reference this household guide which is packed with wonderful natural recipes and ideas for the home. Homemade Cleaners: Quick-and-Easy, Toxic-Free Recipes uses common and inexpensive household ingredients that you probably already have in your home such as hydrogen peroxide, vodka, tea tree oil, baking soda, borax, lemon juice etc. There are over 150 recipes for cleaning needs including dishwasher detergents, concrete rust stain remover, wood patio furniture cleaner, stainless still grill polish, gentle cleaning wipe solution and more. This book also features chapters specifically for parents, repurposing in a disposable society, naturally clean the air in your home (so very important in my humble opinion) and much more making this a comprehensive essential guide. I frequently have purchased natural fruit and vegetable wash at our health food store and a small bottle costs over $6. I was excited to learn that I could make my own Vinegar Vegetable Spray and Vinegar Fruit Soak using just two ingredients i.e. water and vinegar! It couldn’t be easier to make and yet when I looked at the previous bottle that I paid so much money for at the store it has almost identical ingredients for a mere fraction of the cost. My biggest natural challenge in our home has been combatting mold and mildew in our bathrooms since we live in Florida which is very humid and wet. I have tried other natural recipes for a mold and mildew cleaner and nothing worked as well as those harsh chemical brands. The problem? Whenever I use these products it makes me cough and burns my throat so I could only imagine how it would affect my daughter’s damaged lungs. In this book, I found a Mold and Mildew Prevention Spray recipe which included an ingredient that I had never thought to use before (tea tree oil) but it made complete sense. Instead of trying to fight mold this recipe would help prevent it in the first place…..brilliant. I made up a bottle of this formula and spray down the shower and bath tub after every use! There are lots of excellent ideas for natural, toxin-free cleaners that I will be making which are included in this book. In fact, I expect that Homemade Cleaners: Quick-and-Easy, Toxic-Free Recipes will be well-loved and dogged eared very soon in my home library. I highly recommend this book for every household that is looking for easy, naturally derived recipes for virtually all of your indoor and outdoor cleaning needs. It would even make a great gift idea for a new bride or new parent. 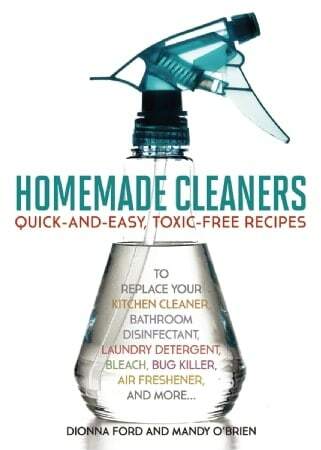 Homemade Cleaners: Quick-and-Easy, Toxic-Free Recipes is available for purchase with a SRP of $14.95. I do like homemade house cleaners that are effective. I also like organic cleaners from companies. There are too many little ones running around. I am in the process of going green as well. my husband is military and deals with chemicals all the time. i never realized how harmful they are I can’t wait to get started. Always looking for items better for the family and home – thanks. Pingback: Purple Monster Coupons | Win a copy of Homemade Cleaners: Quick-and-Easy, Toxic-Free Recipes.